PHUKET, THAILAND — September 26, 2018—Indulge yourself to the delights of tropical paradise as you savor the rich flavor of coconut milk in every sip and bite of the latestseasonal offerings at Hilton Phuket Arcadia Resort and Spa throughout this October. A uniquedining experienceawaits youfeaturing a selection of sumptuous dishes and drinks with coconut milk- the month’s seasonal ingredient. Bringing together authentic Thai cuisine, flavorful cocktails, and a sweet tropical dessert, this new lineup will be sure to tickle your taste buds. Enjoy all the seasonal coconut milk menu items which will be available at Hilton Phuket’s food& beverage outlets: Thai Thai Restaurant, Sails Restaurant, Andaman Lounge Bar, and OBC. Kick off your traditional dining experience by getting a taste of Sails’ Traditional Crab Curry with Rice Vermicelli Noodles. Offering you the freshest crab smothered in the savory flavors of milk and curry, experience the best of Thai cuisine for only THB 500++. Taste the exquisite flavor of fresh seabass in sweet and spicy curry sauce with coconut milk curry.Sails is proud to serve you a tasty Pan-Seared Seabass with Coconut Milk Curry for THB 400 ++. For pasta and curry lovers, Sails brings you a fusion of spaghetti and the famous coconut milk-based chicken massaman curry dish. 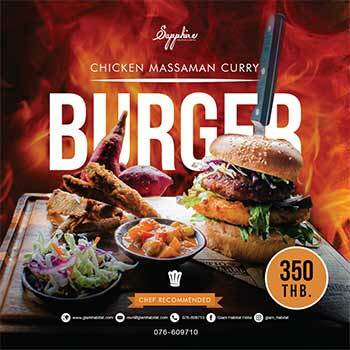 Spaghetti with Chicken Massaman Curry is available for only THB 280 ++. Thai Thai Restaurant boasts of two fresh and flavorful Thai seafood dishes for the month of October. HorMok Ma-Praw – a fish and crab Thai style savory soufflé with coconut milk and Yod Ma-Prow Tom Kati, a delicious prawn soup with coconut milk. Both dishes are priced at THB 320 ++ . For dessert, tickle your sweet tooth and get a refreshing taste of the tropics with a Traditional Coconut Ice Cream available at Thai Thai, Sails, and OBC for only THB 180 ++. Refreshand relax as you sip into fun cocktails to lighten up the moodas you beat the tropical heat. CoCo Cruising combines Havana Club Rum 3 Years, Galliano, coconut cream, pineapple juice, and syrup to give you the tropical party vibe while CoCo Slushy is a magical mixture of Havana Club Rum 3 yrs, Malibu, coconut cream, Carnation Milk cream, coconut ice cream, sugar syrup, white and black sesame seeds, and grenadine. Grab these drinks for only THB 200++ each available at Sails, Andaman Lounge, Thai Thai, and OBC.